The Pioneer Organization “Ernst Thälmann” (named after the former head of Germany’s Communist Party [KPD] who was murdered by the Nazis) included children between the ages of 6 and 13. 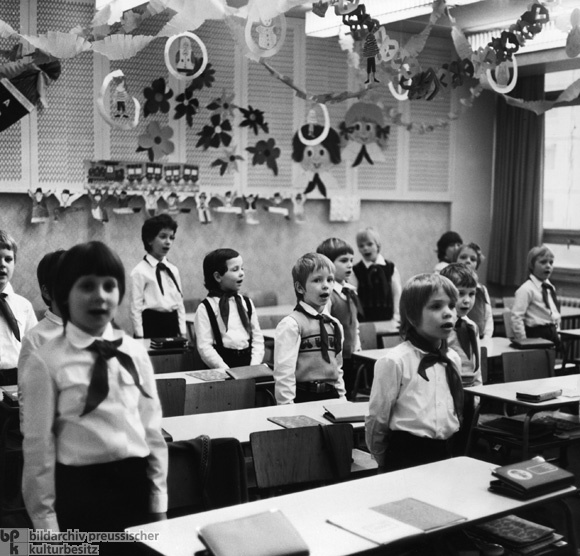 Pioneers in classes 1-3 were called “Young Pioneers”; those in classes 4-7 were called “Thälmann Pioneers.” The pioneer uniform included a white shirt and a colored neck-tie (blue for the Young Pioneers, red for the Thälmann Pioneers starting in December 1973). In addition to its usefulness as an organizational structure, the Pioneer Organization had another important function: namely, to convey both an ideological message and an image of the enemy. In doing so, it employed “The Ten Commandments of the Young Pioneers” and the “Laws of the Thälmann Pioneers” (these included, for example, “Friendship with the Soviet Union” and “Protect peace” on the one hand, and “Hate the warmongers” on the other). According to official statistics, at the beginning of the 1980s, 99% of children between the ages of 6 and 13 were “voluntary” members of the Pioneer Organization. Photo by Ingeborg Uhlenhut.